When the patch on December 6th was released, a feature was added to the “tab” screen to show player pings. Currently, your own ping shows up with a “-“ (a dash, or hyphen), while the pings of other players is visible. First, there’s a misconception that the other players’ pings are their pings to you. This is not the case; the display simply displays the pings all other players have to the server itself. As for displaying your own ping, either this feature was not implemented fully or the failure to display is a glitch. Chances are, this is being worked on and will be fixed in a future patch. 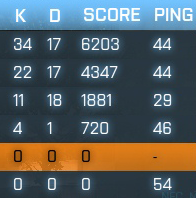 For the time being, the only way to see your own ping is to Alt + Tab and view your ping to the server in Battlelog. As an alternative, you can ask a friend or another player in the server to tell you what your ping is showing up as. I expect this will be corrected soon. Is that some kind of indy joke? It’s the time that takes the server to recieve and send information. for example, if you start shooting you will send a signal to the server saying “he is landing the shots properly” then he will send a signal back to you saying it IS a shot, the time you take to upload the information and for the server to download combined with the time that takes the server to upload it back and for you and everybody else to download is called the “ping” and its usually showed in milliseconds. hey blacklightgamer? i have a question, does upload speed have effect on ping? for example higher upload speed(now i have higher download speed than upload speed), in game if it really matters! i am going to get more upload speeD! Assuming you have a broadband connection with a reasonable upload speed (at least 512Kbps), increasing your upload speed will not have an impact on your ping. Only your distance to the BF3 server and the number of hops in between matters. With some broadband providers, you can pay for a higher-tier internet connection which will prioritize packets for games. Not all providers offer this, and you’d need to contact them to see if this is available. Otherwise, any of the various speed offerings from your internet service provider will offer the same ping.